This article is about the sixth generation of the Chevrolet Camaro. For general Camaro information, see Chevrolet Camaro. The sixth generation of the Camaro, produced by American automobile manufacturer Chevrolet, was first introduced to the public on May 16, 2015. Sales started in 2015 for the 2016 model year. The Camaro now utilizes the GM Alpha platform shared with the Cadillac ATS and CTS and features MacPherson struts in front, rather than the former Multi-link setup. General Motors claims that 70 percent of architectural components in the new Camaro are unique to the car. The sixth generation of Camaro saw production return to the United States as the fourth and fifth-generation models had been assembled in Canada. Like its predecessor, the sixth generation of the Camaro is available in coupé and convertible bodystyles. Compared to the previous generation, it is 2.3 in (58 mm) shorter, 0.8 in (20 mm) less wide and 1.1 in (28 mm) shorter in height. With similar equipment and engine, it is also more than 200 lb (91 kg) lighter. Trim levels introduced at launch were LT (1LT, 2LT) and SS (1SS, 2SS). Standard equipment on all trims includes automatic air conditioning, cruise control, tilt/telescoping steering wheel, satellite radio, parking assist and seven airbags. Chevrolet added a base LS (1LS) trim level for the 2017 Camaro. Trim level content for the LS is identical to that of the base 1LT trim, with the exception that the 2.0 L turbocharged inline-4 engine and 6-speed manual transmission would be the only available powertrain options for the LS trim. The LS trim was initially introduced in coupé form, followed later by an LS convertible. The 1LT trim received the 8-speed automatic transmission with shift paddles as standard equipment for 2017. For the 2017 model year, the 1LE Performance Packages returned, tailored for the V6 and V8 powered six-speed manual equipped coupé models respectively. Both of 1LE packages offered share a satin black hood wrap, front splitter, and a three-piece rear spoiler. The V6 1LE package adds FE3 suspension from the Camaro SS, 20-inch forged wheels with Goodyear Eagle F1 245/45R20 front tires and 275/35R20 rear tires, Brembo 4-piston front brake calipers, mechanical limited-slip differential with a 3.27:1 ratio, track-cooling package, suede steering wheel and short-throw shifter, dual mode exhaust, Camaro SS fuel system to accommodate higher-load cornering, and a high flow front grille. The SS 1LE package adds the Magnetic Ride Control FE4 suspension derived from the ZL1, electronic limited-slip differential with 3.73:1 ratio, 20-inch forged wheels with Goodyear Supercar 3 285/30R20 front tires and 305/30R20 rear tires, Brembo six-piston front brake calipers with two-piece 14.6-inch rotors, track-cooling package, Recaro front seats with suede and leather upholstery, suede steering wheel and short-throw shifter, dual mode exhaust, and a color heads-up display. The ZL1 model, which is a high performance variant of the Camaro SS was introduced in 2017. It features a lower grille opening for improved cooling, a new front splitter and a carbon hood insert which removes hot air from the engine compartment. It also features wider front fenders to accommodate wider tires for improved handling, unique rockers and Magnetic Ride suspension. Transmission choices are a rev matching six-speed manual or a newly developed 10-speed automatic. The 10-speed 10L90 transmission was developed in collaboration with Ford. General Motors manufactures its own version in its own factory in Romulus, Michigan. A more track-focused version known as the ZL1 1LE features Multimatic spool-valve shocks (similar to the previous generation of the Camaro Z28), a new front splitter, dive planes and a rear wing, and wide "Goodyear Eagle F1 Supercar" tires. Weight was also reduced by 60 lb (27 kg) as compared to a standard ZL1. Performance figures include a 0 to 60 mph (97 km/h) acceleration time of 3.5 seconds, a 1/4 mile time of 11.4 seconds at 127 mph (204 km/h). The ZL1's official top speed is 198 mph (319 km/h). The 2.0 L LTG Ecotec turbocharged Inline-4 which has a power output of 275 hp (205 kW) at 5,600 rpm and 295 lb⋅ft (400 N⋅m) of torque at 3,000 rpm and is the first 4-cylinder in a Camaro since the 3rd generation model. It is available on 1LS, 1LT and 2LT trims. The 6.2 L LT1 V8 engine which is shared with the Chevrolet Corvette and has a power output of 455 hp (339 kW) at 6,000 rpm and 455 lb⋅ft (617 N⋅m) of torque at 4,400 rpm. The 6.2 L supercharged LT4 V8 exclusive to the ZL1 models. Output is 650 hp (485 kW) at 6,400 rpm and 650 lb⋅ft (881 N⋅m) of torque at 3,600 rpm. All engines are available with 6-speed manual and 8-speed automatic transmissions, except for the ZL1 models which uses a 10-speed automatic in addition to a standard 6-speed manual. General Motors Holden's performance division, Holden Special Vehicles is engaged in the import and conversion of the Camaro to right-hand-drive and Australian Design Rules, since the second half of 2018. Unlike Holden's previous US import (based on Chevrolet Suburban) in the late 1990s, HSV will keep the Chevrolet badge on the converted Camaro. The HSV Camaro is based on the pre-facelift European Camaro 2SS and is equipped with an 8-speed automatic gearbox. HSV has planning a conversion total of thousand units per year for three years until the seventh generation of the Camaro is introduced in 2020. Eventually, HSV introduced the manual gearbox to the Camaro model range for Australian and New Zealand markets along with high performance ZL1 model. Chevrolet also exhibited a 2019 Camaro SS at the 2018 SEMA Show in the new Shock yellow-green exterior color, which became available in early 2019. It also featured a "concept" front end, which unlike the production version of the SS has a body-colored bumper and the Chevy "bow-tie" badge moved to the upper grille. 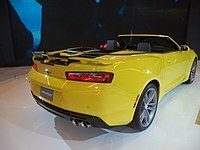 The concept car of the sixth generation of the Camaro appears in the film Transformers: Age of Extinction as the second alternate mode for Bumblebee, and the paint job resembles that of the convertible variant of the car. A second modified version of the car appears in the film's sequel, Transformers: The Last Knight previewing the facelift of the car which would be introduced in 2018. ^ a b "2016 Chevrolet Camaro". GM Authority. Retrieved 2015-08-31. ^ a b "2017 CAMARO ZL1 VS. EVERYBODY". chevrolet. Chevrolet media. Retrieved 16 March 2016. ^ Csaba, Csere (July 2015). "2016 Chevrolet Camaro Dissected: Chassis, Powertrain, Design, and More". caranddriver.com. Hearst Communications. Car and Driver. Retrieved 2015-08-31. ^ Tingwall, Eric (Feb 2017). "2017 Chevrolet Camaro ZL1 Automatic". caranddriver.com. Hearst Communications. Car and Driver. Retrieved 24 August 2017. ^ "Lighter 2016 Camaro Delivers Benchmark Performance". Chevrolet. ^ Tingwall, Eric (Nov 2015). "2016 Chevrolet Camaro SS vs. 2015 Ford Mustang GT". caranddriver.com. Hearst Communications. Car and Driver. ^ Kierstein, Alex (Sep 29, 2014). "The clearest look yet at the 2016 Chevy Camaro". roadandtrack.com. Hearst Communications. Road & Track. ^ Stenquist, Paul (2012-12-19). "Camaro production returning to the United States". The New York Times. Retrieved 2014-11-27. ^ Vijayenthiran, Viknesh (2015-05-28). "Michigan's Lansing Grand River Plant Gears Up For 2016 Chevy Camaro Production". Motor Authority. Retrieved 2015-08-31. ^ "Chevrolet To Lower Starting Price Of Mid-Model Year 2017 Camaro By Adding New Base 1LS Trim". ^ "New 1LE Packages Elevate Camaro Track Capabilities". media.gm.com. Retrieved 2017-01-26. ^ "Celebrate The 50th Anniversary Camaro - Chevrolet". www.chevrolet.com. ^ "Camaro Hot Wheels Edition - Chevrolet". www.chevrolet.com. ^ "2018 Camaro & Camaro ZL1: Sports Car - Chevrolet". www.chevrolet.com. ^ Chris, Perkins. "The 2018 Chevrolet Camaro ZL1 1LE Will Cost $70,000". Road and Track. Hearst Communications Inc. Retrieved 30 August 2017. ^ "The Camaro ZL1 will do over 200mph*". www.topgear.com. ^ "Chevrolet Camaro VI 6.2 V8 (453 Hp) Technical information". ^ Pettentry, Marton (14 May 2018). "HSV's Camaro will be auto only". Motoring. ^ Tripolone, Dom (24 June 2018). "Sunday 7: Hottest cars coming this winter". Sydney Morning Hearld. ^ Newton, Bruce (4 June 2018). "Chevrolet Camaro Manual Confirmed". Motoring. ^ "The New 2019 Camaro Sports Car: Coupe & Convertible". www.chevrolet.com. Retrieved 2018-10-09. ^ "The New 2019 Camaro Sports Car: Coupe & Convertible". Chevrolet. ^ "2019 Camaro Is Awesome in Shock". media.gm.com. Retrieved 2018-10-21. ^ "Chevy Pulls a Two-Fer, Takes Motor Trend Awards with New Camaro, Colorado Models". www.yahoo.com. Retrieved 2015-11-17. ^ Gall, Jared (November 2015). "2016 10 Best Cars: Chevrolet Camaro". caranddriver.com. Hearst Communications. Car and Driver. Retrieved 2017-07-06. ^ Pund, Daniel (November 2016). "2017 10 Best Cars: Chevrolet Camaro". caranddriver.com. Hearst Communications. Car and Driver. Retrieved 2017-07-06.